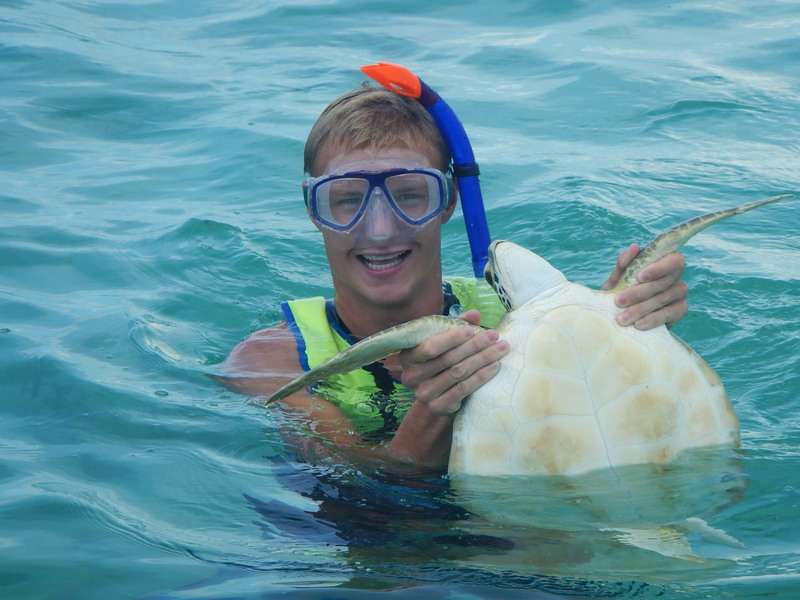 A group of 18 students from Skyline school in Seattle joined the turtle team at the start of April on an action packed 9-day Earthwatch expedition. 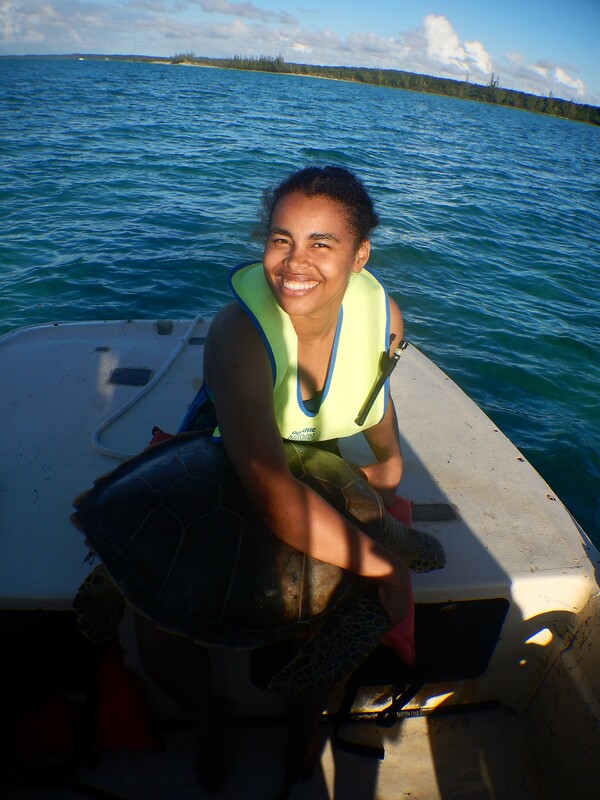 Days were filled with turtle abundance surveys, baited remote underwater video (BRUV) deployments to assess predator distribution, and the capturing of turtles to collect morphometric data (measurements and weight). 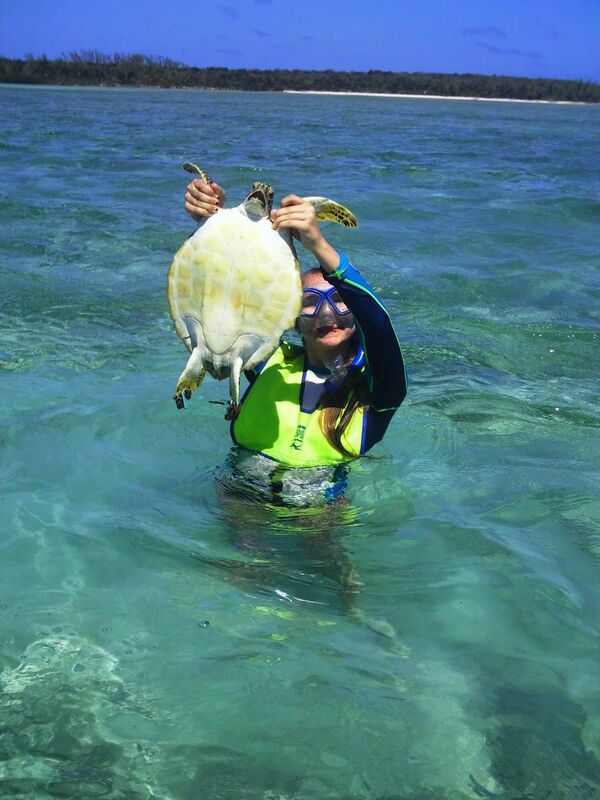 For some of the students, this trip was their first experience of snorkelling, travelling in boats and seeing wild turtles. Despite a few nervous faces at the start of the trip all the students quickly embraced this new experience and the rest of the time was filled with excited faces and (a lot of) happy singing! The students had a great time exploring different habitats while looking for turtles. The most turtles counted in one day was 80 at Half Sound on the Atlantic side! 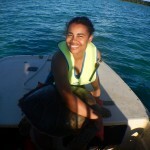 In total over the 9 days the group counted 179 turtles and caught 18 turtles for morphometric data collection. 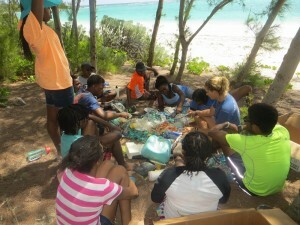 The Earthwatch students spent their final night with the turtle team having dinner on Sunset Beach. As the sun sank below the horizon, each student gave their favourite memory from the past 9 days. These ranged from watching some of their peers with their ‘interesting’ methods of getting into and out of the water from the boat, to singing on the van trips to study sites, and enjoying the very bumpy boat rides on windy days. However, there were two favourite memories that all the students could agree on; working hands-on with sea turtles, and the passion that all the researchers at CEI have for their research projects. 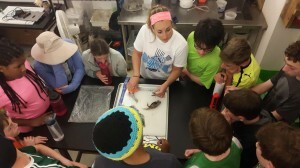 Thank you Skyline School for your enthusiasm and hard work during your Earthwatch expedition! The Grade 5′s post The Island School’s youngest RUN-SWIM EVER!!!!! I can now safely say that I can jump into water and actually not drown. 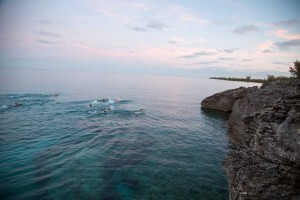 Early this morning before the sun itself was up we embarked on a “Run Swim”. We did multiple drills that would help us feel more relaxed in the water and know what to do to conserve energy. When I first arrived I had no idea how to swim. I relied heavily on every flotation device around even when I have my PFD (Personal Flotation Device) on. After the drills I was able to swim from one shore to the other by myself, even though I did swallow more salt water than needed and flipped over on my back when I meant to swim forward. 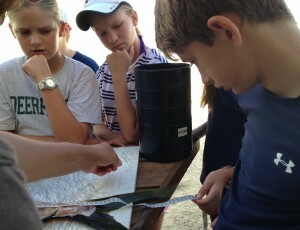 After breakfast, we had a small lesson on plastic and how much ends up in the ocean. We then proceeded to Cotton Bay Beach where we picked up plastic of the beach and did a not-so-competitive competition to find the weirdest things. 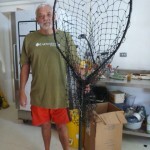 We found a lot of nets, refrigerator door, toothpaste tube (made in the US, package designed in the UK) a plate, some clothes, and a lot of unidentified objects as well. Overall it was a great way to give back to the earth and to save the fish even though I never eat any. In the end we had three full boxes and had to leave some there to grab later. OAK Leadership Institute from Cleveland, Ohio joined us the first week of April for an action packed week. 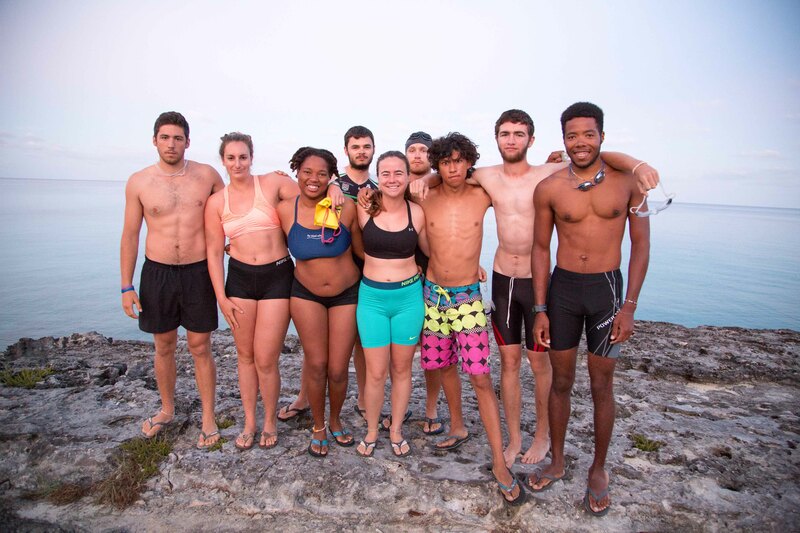 The five students and two teachers had the time of their lives exploring Eleuthera and the plethora of marine habitats we are so fortunate to live beside. 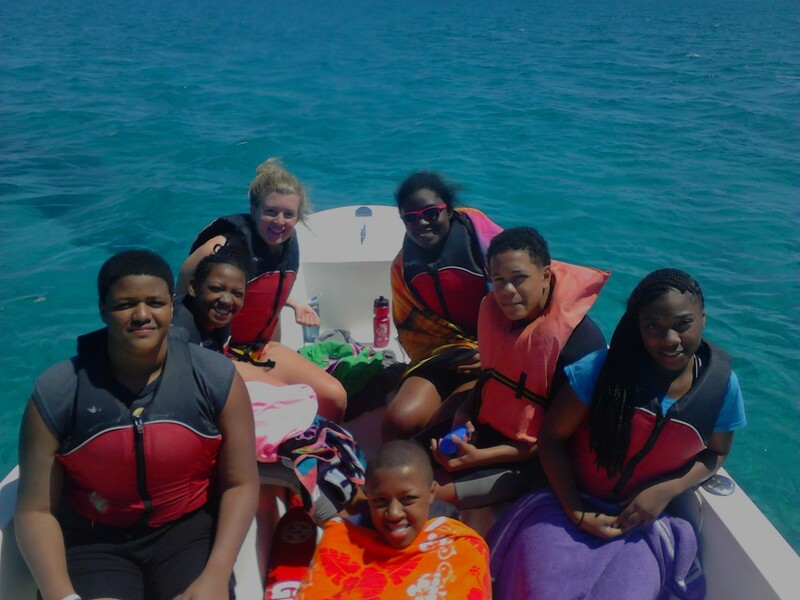 Students on the boat ready for their sea turtle abundance surveys. 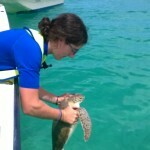 One particular highlight for the team was assisting with the stingray ecology research project. They joined the Island School research class out on the Schooner Cays to capture, measure, tag and work up southern stingrays. 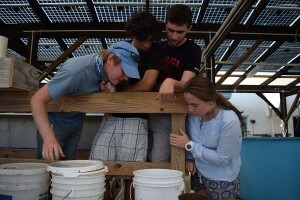 It was great to see both Island School students and our visiting students working together to support this project. Most of the students also got a chance to experience camping on a beach for the first time, it was an awesome trip of firsts, exploration and learning. 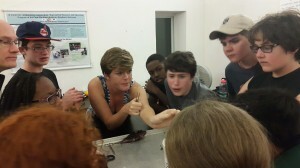 Big thanks to OAK Leadership for bringing the first group of students down to us, we hope to see OAK return next year! Comprised of three events, the triathlon aims to challenge the students using all aspects of our environment and our resources. Individually each aspect is more than manageable – ½ mile swim, 13 mile bike, 3 mile run; together they provide a veritable challenge for any competitors. In our typical unconventional style, each competitor must complete the triathlon on one of the schools beach cruisers, giving our triathlon an island feel. LREP Intern Alanna Waldman shows students from the Ratner School how to safely remove venomous lionfish spines. LREP Research Assistant Alicia Hendrix describes envenomation mechanisms to listening students and shows them a lionfish spine close-up. 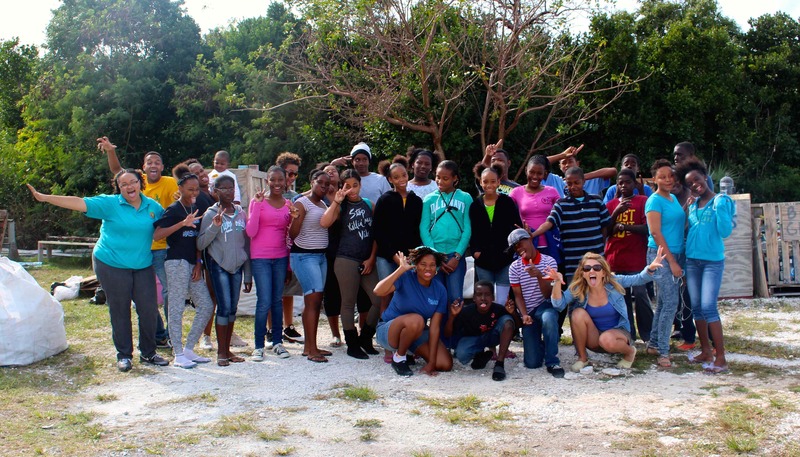 Eleuthera was recently visited by a group of students from Williams College (Massachusetts). 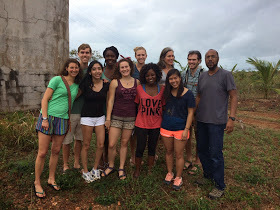 Their trip focused on Eleuthera’s food systems, with a focus on sustainable production. 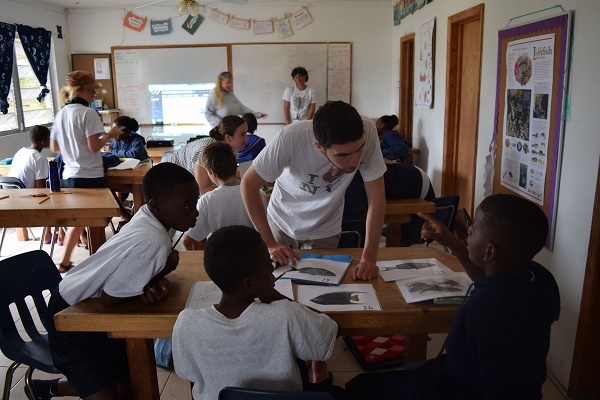 Over the past two weeks these students conducted interviews with farmers, restaurant owners, food market attendees, and fishermen all over the island. They also studied the sustainable systems we have right here at the Center for Sustainable Development (CSD), particularly the organic garden and the aquaponics system, which feeds roughly 125 people/day. The Williams College group with Nassau resident Mr. Bhatti. 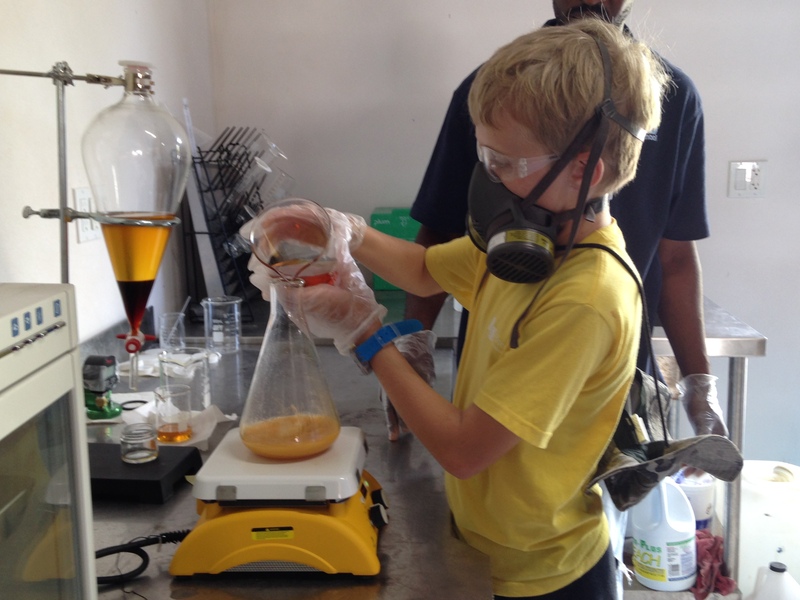 Read more on their blog about their visit! 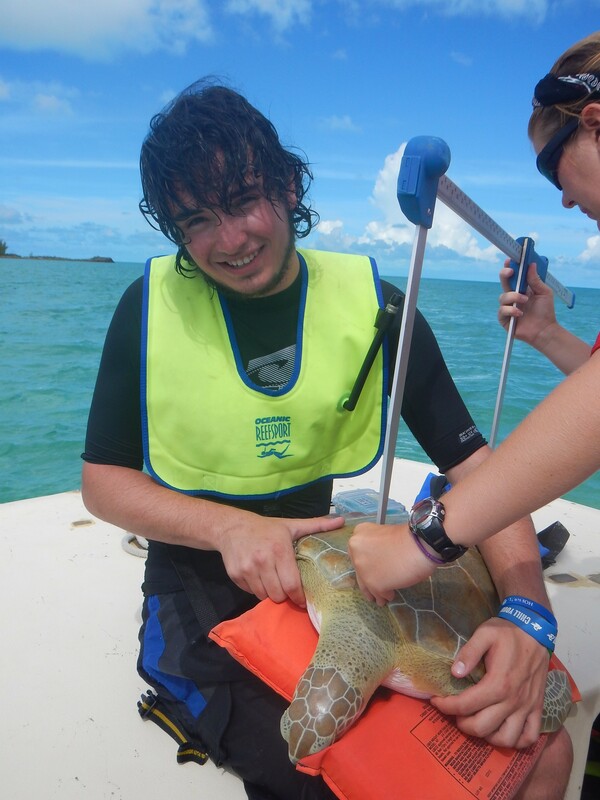 Earthwatch Sea Turtle Programs have a successful year in 2014! 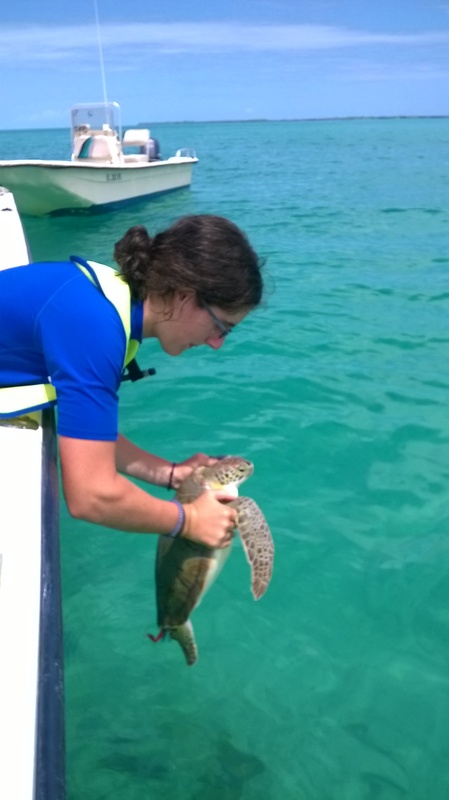 9 expeditions, 92 volunteers, 115 turtles, and 145 Baited Remote Underwater Video Surveys - just a taste of the successful year the Earthwatch-funded sea turtle research program had in 2014! All pictures depict volunteers helping out with every aspect of the research project. This is the first year of study that Earthwatch has supported the sea turtle research program at CEI and 92 Earthwatch volunteers travelled to Eleuthera to assist with fieldwork between February and November this year. The age range was 15 – 80 years old and over the course of nine days volunteers helped conduct sea turtle abundance surveys, deploy and analyse baited video surveys to look at shark abundance and diversity, and hand capture turtles – plus they got to have some fun snorkelling and touring around Eleuthera! 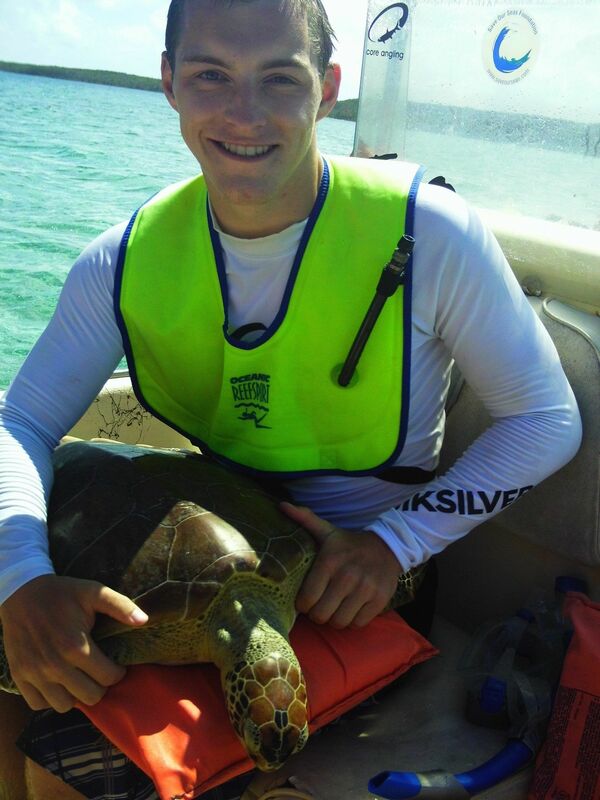 The main species caught is the green turtle (Chelonia mydas) however a few hawksbills (Eretmochelys imbricata) were also tagged! 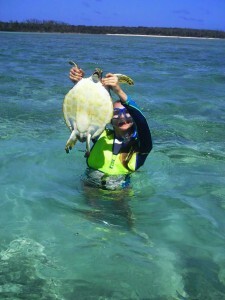 The study is well on its way to better understanding forgaing ground use by juvenile green sea turtles. 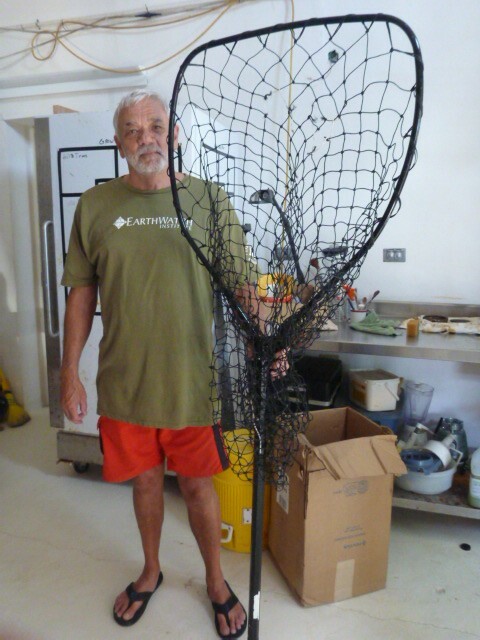 The study spans across 10 sites around South Eleuthera and Earthwatch volunteers are critical in providing man-power to actually complete field work as well as funds to cover research costs. 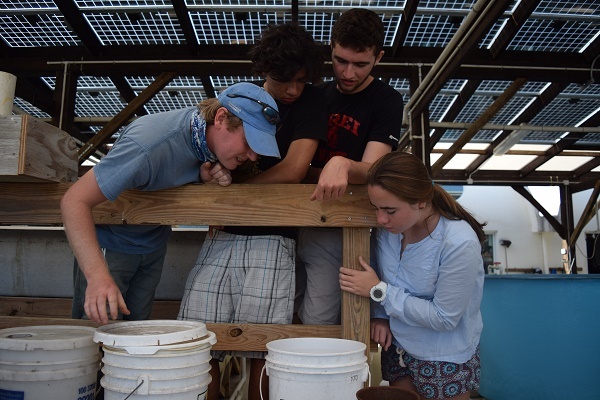 Thank you to all the volunteers, interns, Research Assistants and staff at CEI, as well as the Family Island Research and Education team, for their contributions this year – we’re looking forward to another busy and successful year in 2015!